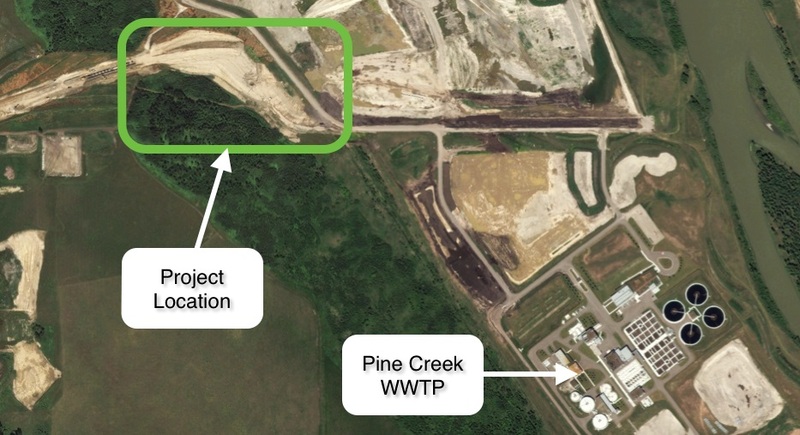 The Pine Creek WWTP is a major part of the future sanitary treatment infrastructure for the City of Calgary and will support southward growth in the City for decades to come. Major municipal development on the west side of the Bow River is to be supported through the construction of a 1.95 m diameter sanitary trunk that is expected to convey sanitary flows up to 3.8 m³/s along a 210th Ave SW utility corridor. In the last few kilometres before reaching the Pine Creek WWTP, the sanitary trunk must come down the Bow Valley escarpment. With a gradient of approximately 10% over a 500 m length, a great deal of energy must be dissipated in a controlled manner. Beyond providing a robust energy dissipation system, a key requirement was for the energy dissipation structure to split feed water to three sanitary syphons. Successfully combining an energy dissipation and flow splitting design is very difficult and there are few firms with practical experience delivering solutions for these problems. In order to meet the specific and significant site constraints, it was necessary in 2010 for source2source inc. to develop a novel combination of in-pipe energy dissipation with a compact stilling basin.